First of all, i adore Samorost and have already pre-ordered Machinarium... you guys are awesome! 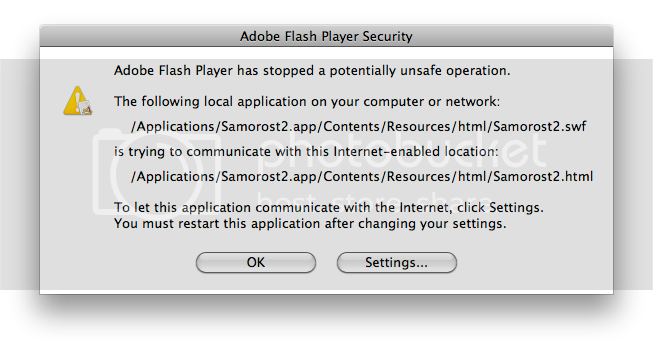 When i open Samorost 2 on my mac, Flash asks me for authorisation of Local Storage. I agree and restart Samorost 2 just to be sure. clicking on the parachute on the ground simply makes the parachute's button disappear without actually releasing the dog. thinking that it might have something to do w/ variables from previous levels being needed, i loaded the last level of chapter 1.
i can still load levels, but they are all broken. i don't want to raise a fuss, but i've paid money for this game, and it's not behaving! Does this happen even after you've double-clicked the Samorost2.swf file? Is it possible that you are clicking on one of the other, separate, level-specific swf files? I ask this because I also have a Mac, and what you've described, for example, about the PLANINA level happens when I click on the planina.swf file. And, as you'd mentioned, the rocket never comes on the first level of chapter 1 if I double-click the poklop.swf file. Have you tried launching the game using a standalone version of Adobe's Flash Player? ...Flash asks me for authorisation of Local Storage. And why do I get the feeling that that might be the problem? I dunno. Sorry. I wish I could be of more help. Adobe says to set allowed storage to 'none', which will delete everything, but that doesn't help either. I am experiencing the very same issue, and I will try to explain it further. But before that, let me just congratulate with you guys for the amazing quality of Machinarium. Bought yesterday and already finished it, just couldn't stop! Amazing quality, and great point and click adventure. Now, going back to the issue. On the wave of excitement generated by Machinarium, I decided to buy the full version of Samorost 2. I downloaded the Mac version, copied the app in my Application folder and started playing the game. After I while I took note of the code for the accomplished level, quit the game, and went out. When I got back, I re-launched the game, put the code in, and got stuck. I'm currently at the "Planina" level, and if I click on the dog underneath the parachute, it doesn't come out as it supposed to do. At first I thought of a Safari issue. So I tried it in Firefox, same issue. So I thought of reinstalling the app from the dmg, same issue. I also tried loading a previous level, same issue: I am not able to go on in the loaded level. I have also tried to restart the game from the beginning, but soon after you press "play" the screen goes black instead of loading the first level. I'd downloaded the Mac version of the game several months ago and I hadn't received an .app file, which is to say that one didn't exist back then. So, perhaps Amanita has uploaded a newer version since that time which is somehow corrupted? Also, I'm running Tiger and nemoDreamer (obviously) is running Leopard, but I seriously doubt that's an issue. I feel tempted to have the two of you e-mail me so I can send both of you the files I have to see whether or not those would work, but I'm not sure if that would be frowned upon. I bought Samorost 2 a while ago and don't have the .app file, any way I can get it? i've just finished Machinarium, and have a hole that desperately needs to be filled with Samorost 2! could this be Snow Leopard's fault? 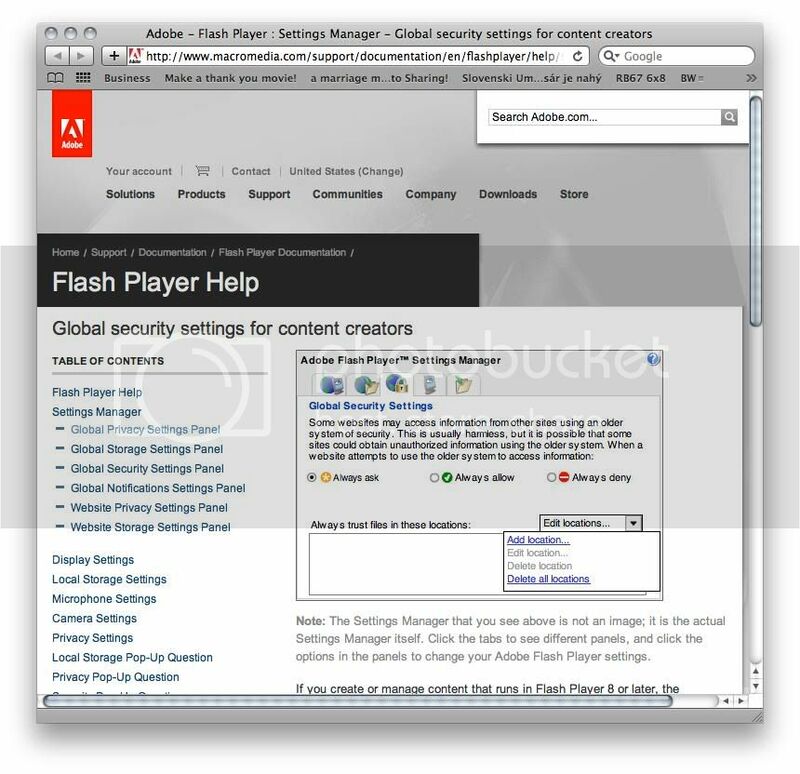 i downloaded the latest flash stand-alone (http://www.adobe.com/support/flashplayer/downloads.html), and also played around with Adobe's "LocalContentUpdater" (didn't do what i expected it to). this all didn't solve the problem. I've bought Samorost 2 yesterday and had problems with Mac version not working correctly, too. The problem relies on Flash security settings which prevent flash player to access local files. Generally this makes sense, because without this barrier some websites could access private information from local file system. The workaround is quite easy (if one is aware of this). I've attached 4 pictures to describe this. Due to total size limit of attachments I have to split the post. 7. From lower edit box copy the first part of path without Samorost2.swf (otherwise other flash files will be denied) and copy it into upper edit box. (Other versions of flash players may behave differently).